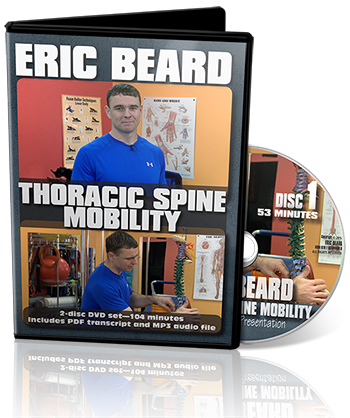 Most people don’t move really well through their thoracic spine. They don’t rotate very well, but that’s the topic—thoracic mobility. Most people make that rotation through the lumbar spine. The lumbar spine really only has, as we stack those segments together, about 10 to 12 degrees cumulatively of rotation. If I’m facing front here and these are my lumbar vertebrae, this is about 10 degrees of rotation. That’s all we have in the lumbar spine. We should be getting about 45 to 60 degrees from the thoracic spine, so if we’re closed here and we can’t rotate to the thoracic spine, the burden falls down here. Lo and behold, most of the disc injuries are down at L5-S1 and L4-L5. They are taking up movement as compensation for lack of mobility through here, so not only are they a different structure, but also a different function. What we want to promote is the ability to often extend our thoracic spine, but we really want to go after the rotation. We’ll look at that with our clients today and we’ll talk a little bit more about it as we move through our presentation. Function: there are a few different aspects to function, so if we look locally, we can look at form closure or articular function. I touched on that earlier when I talked about the facet joints articulating together. We should have the joints fitting together and aligning properly, moving through all ranges of motion—flexion and extension, lateral flexion or side bending, as well as our rotation. These joints should stack up in alignment and articulate or move properly. We don’t want to wear down the discs. We don’t want to wear down ligaments or cartilage. We want to maintain integrity of the structure. There’s also something called form closure. Form closure is more neuro-myofascial in function, so we have this soft tissue complex in and around. We have the local musculature, which we’ll talk more about, as well as the global musculature. This can be a big picture issue throughout the kinetic chain or dialed all the way down. However, if the joints are lined up and they’re moving correctly, we have to make sure the tissue around them is providing the appropriate stress and support through there to maintain alignment, as well as load transference. That form closure is the length-tension relationship of the muscles and the tissues around there. It’s the tissue quality health that allows for extensibility and contractility of those tissues.